Here is a Special Link to 1993 Graduates Guestbook . . .
PayPal option available soon. "Who's attending?" - Maria DeFeo, Mary Quinn Battaglia, Betsy Schopp Cali, Carrie Hale, Nicole Reid, Kristine Adamczyk, Stacy Sabo and Dan Parker. Bill Gworak, Dave Backlund, Dave Castiglia, John Lockett and Melanie Koch, Vicki Cook, Karen Hiam, John Sirianni, Tami Ewert, Lisa James. Kyle Greene, Robyn Blanchard, Alissa Venturini, Stephanie Beyer, Steve Lestingi, Theresa Soluri, Mark Landroche, Leia Hill, Erik Linton, Kristy Lanthier. Adam Peters, Becky Wilson, Karin Serafin, Andy Tranter, David Miller, Jeff Roth, Jared Smith, Kristina Laurendi, Paul Prior. The GIHS 1993 Reunion is planned for Friday, July 5th at the Holiday Inn in the evening. There will be appetizer stations, open bar, music & fun. Complete information and payment details will be posted shortly. If you need a hotel room, mention our class when booking. If you are not on Facebook, please send an email to Betsy Schopp Cali with your information and any pictures of school days you want to share. Reunion Committee - Betsy Schopp Cali, Maria Defeo and Mary Grace Quinn. Next Meeting planned for end of Jan.., if interested in helping email Betsy. 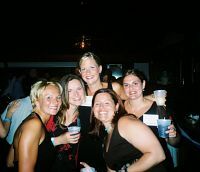 The GIHS Class of 1993 is planning a 20th reunion over July 4, 2013 weekend. Classmates are asked to email Betsy Schopp Cali or call 725-8939. 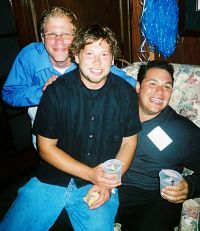 A casual 15-year reunion for the GIHS Class of 1993 is planned for 7:30 p.m. Saturday, July 5, 2008 at the Brick Oven, Grand Island Plaza. Those planning to attend are urged to help with a head count by Emailing Betsy Schopp Cali or calling her at 725-8939 before July 5th. 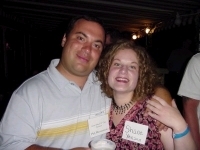 The Class of 1993 ten-year reunion photos, taken during the event in 2003, were submitted by Heather Prast McDonnell. 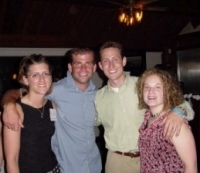 Class of 1993 photos show (left) Gina MacKendrick and Phil Mastantuono, and Karen Samrany, Matt Linenfelser, Brett Long and Gina MacKendrick (right). Thanks to Karen Samrany for providing these. 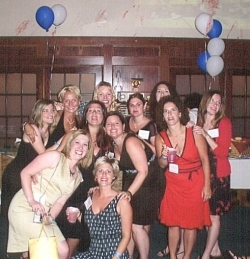 Members of the Grand Island High School Class of 1993 celebrated the 10th anniversary of their graduation with a reunion at River Oaks Golf Club July 5, 2003. These photos were submitted by Betsy Schopp Cali. The deadline is near for the responses... June 9th! If you need more time, or have any questions, please notify Betsy Schopp Cali at betsy@raru.com or 775-0306. Please get your "what have you been up to" questionnaire back ASAP. If you need a new one or an email version, just notify Betsy. Hope to see everyone there! If you have information on how to contact any of these classmates, email to grandislandclassof1993@yahoo.com or call Betsy Schopp Cali at 775-0306. Members of the Grand Island High School Class of 1993 are invited to attend a 10-year reunion planning meeting February 23, 2003. Those interested in attending the meeting or helping with the reunion are asked to contact Betsy Schopp Cali. Plans are underway for a very special event at River Oaks Golf Club on Saturday, July 5, 2003. Please mark your calendars and plan on joining us for food, spirits, music & fun!!!! Official invitations will be mailed in April, allowing plenty of time for RSVP�s. There will be a Reunion Planning Committee meeting on Sunday, January 19, 2003 � Please contact Betsy �Schopp� Cali for details at (716) 775-0306 or Betsy. Open to families? Classmates only? Class of 1993 float in the Grand Island 4th of July parade?